Having decided to do this page I thought I’d misquote Shakespeare in saying if it is to be done it is best to be done quickly. If I don’t get on it right away I’ll start to get too complicated, try to polish it too much and end up with just one more incomplete project. As such, I don’t think you’ll go too far wrong if you treat it as a work in progress featuring a series of thoughts on eating things which may or may not be worth the effort. I’m starting with this because it was on a list someone sent me and because we have some a few yards from where I’m sitting. 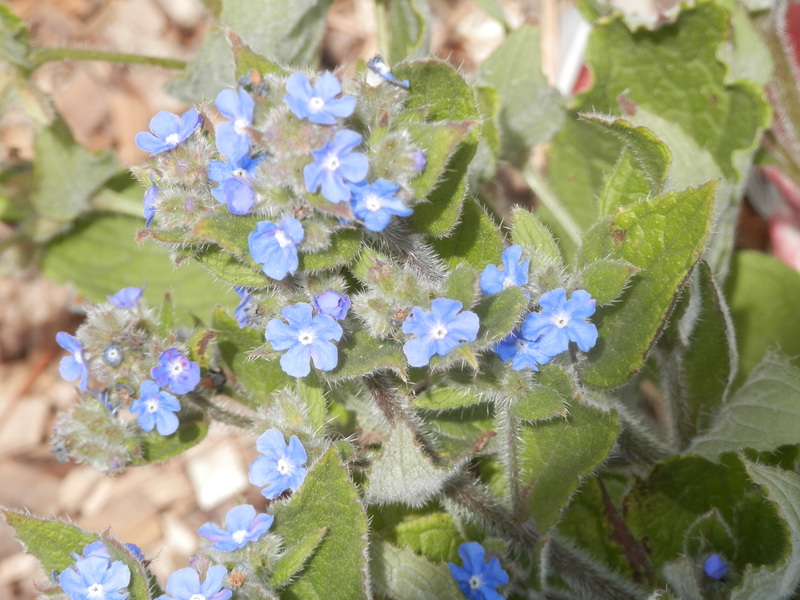 It’s called green alkanet because it’s an evergreen member of the family. It has hairy leaves, well hairy everything, in fact and small blue flowers, being in many ways like borage, and coming from the same family. I won’t spend too long on it, as it isn’t worth it. The only part said to be edible is the flowers, which are said to be mucilaginous (which I interpret, rightly or wrongly to be having a mucous-like property – not a quality you often find and a word I’ve only ever seen in connection with eating flowers or plants). They have a reasonably fresh taste but are tiny and hard to pick off with your fingers. I tried picking them and biting them off but that just ended up with me getting bristles in my tongue and lips. It isn’t particularly unpleasant but I could do without it. That’s nought out of ten for me – they just aren’t worth the trouble of picking. Smaller than borage, harder to pick than borage, less tasty than borage – why bother? 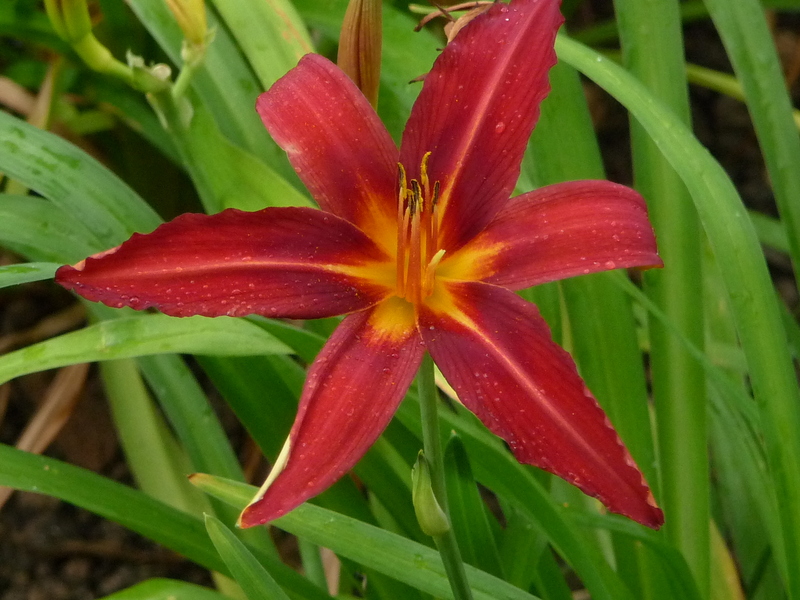 Best, in my opinion, left alone or used for compost. A note on bristles – after six hours I was actually finding the effect of the bristles on my tongue a bit unpleasant (which might have been worsened by eating horseradish leaves) and there was a distinct white patch on the tip. After 48 hours there’s still a bit of a numb feeling and a patch of whiteness present. Definitely not keen on this one! So far I’ve only eaten a raw bud, which seemed crispy, fresh and slightly onion in flavour. Things went slightly downhill when I subsequently read a website which suggested that some cultivars might not be as wholesome as the originals. There was also a suggestion of flatulence in some users. There are plenty more edible bits to the plant so I’m going to plant some more for next year and carry out more tests, including tempura. Known as Lamb’s Quarters in the USA. 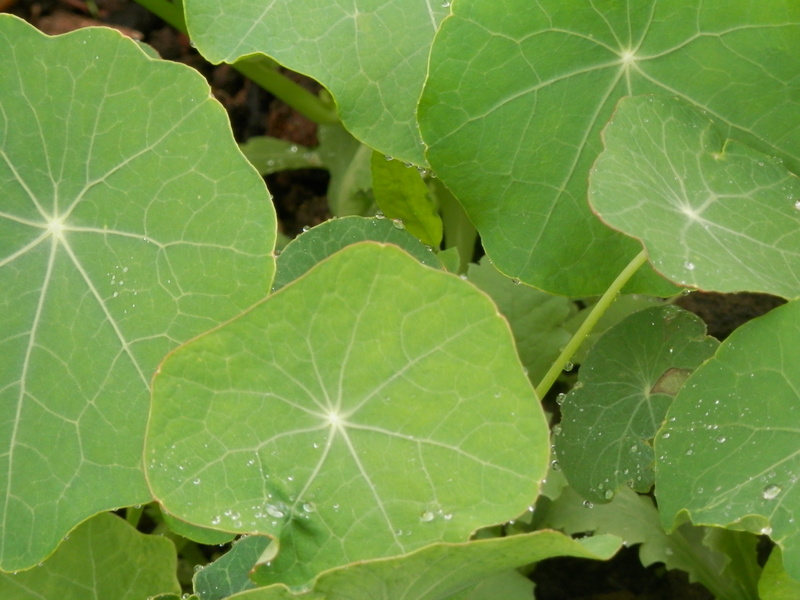 The leaves and young shoots are edible and the plant is very nutritious. It is also one of the few foods I forage that is actually pleasant to eat. One hundred grams of raw leaves contain 96% of your daily Vitamin C requirement and 73% of your Vitamin A. It also has over 30% of your Riboflavin, Manganese and Calcium requirements. You can also gather the seeds as it is related to quinoa, though you will need patience, and you will need to check on the level of saponins – I seem to remember you have to wash quinoa grains when harvesting. From archaeological evidence we know that it was eaten in Neolithic times and that its use continued to the sixteenth century when it was replaced by spinach and cabbage. It grows vigorously in good soil and is a strong competitor in an agricultural setting, particularly with potatoes and root crops. I have been growing it under runner bean canes this year but it grew too quickly and too tall and had to go. Worldwide it is cultivated as a crop for human and animal use and the leaves and seeds are popularly used for a variety of foods in India, including soups, curry, stuffed breads and even as the basis for a mildly alcoholic drink. Our chickens like it but the pigs aren’t keen , despite the alternate name of pigweed. I have eaten the larger stalks and they taste very much like the stalks of calabrese, though I was the victim of stomach cramps an hour or so after eating them. It could be coincidence, but I will have to check it out before recommending eating the stalks. There’s a Nettle and Fat Hen Quiche recipe in the recipe section and I’m going to have a go at soup in the next week or so. 11.04.16: Looks like I forgot to follow up on the soup. It was good though there was a definite metallic tang to it. I’d probably dilute it with some other greens next time, though I offered it to a group of parents that do a lot of juicing and they were all happy with it and intend making it again. 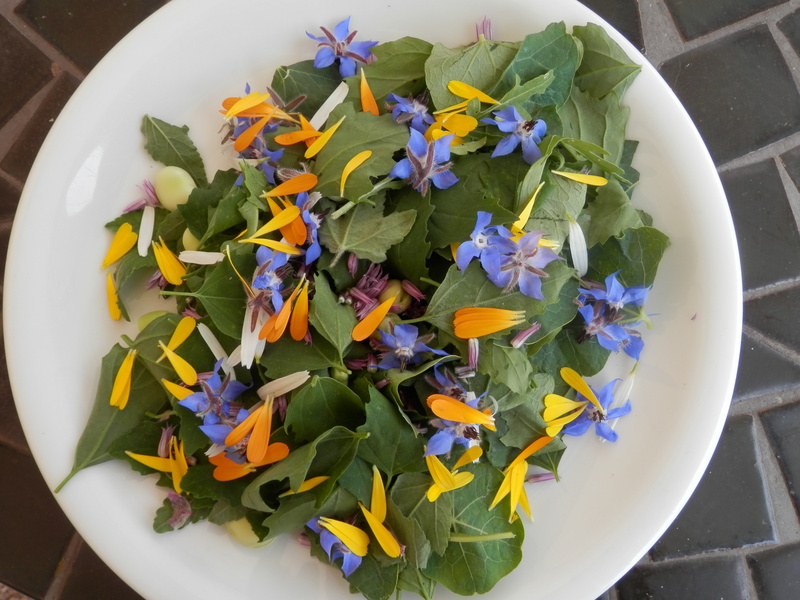 Salad with fat hen, nasturtiums, mallow and a selection of flowers. See Fat Hen. Yes, I know this looks strange at the moment but when I get more entries in here it won’t be the one immediately after Fat Hen. One of the first plants mentioned in writing – Horace said “Me pascunt olivae, / me cichorea levesque malvae” (“As for me, olives, endives, and mallows provide sustenance“) That would be in the first century BC. Not my sort of diet. Young leaves can be used in salads, older leaves are used as a green vegetable and they are commonly eaten in Turkey and parts of India. They are often said to be mucilaginous (see above) and a mouthful can be quite glutinous. I’ve often eaten them in salads and find them quite palatable. I’ve also often fed them to visiting groups of children and they have never complained about them. We’ve also used the garden varieties and they have always been OK.
As part of a salad the leaves are fine. I have yet to try the older leaves as green veg but will see what happens. The buds are said to be good in salads or to eat as a snack and some foragers rave about them. If you take all the outer parts off they are a fresh, nutty snack, but very small. If you don’t take the outer parts off they are fairly unremarkable to me. Anyone have any hints or tips on this? I’d hate to think I was missing out. Apart from being a useful trailing plant for bad soil and a good sacrificial plant for attracting egg-laying white butterflies, the leaves are good in salad and the flowers make a good garnish. You can also pickle the unripe seeds like capers, though I have never done it. One species produces large tubers which provide a useful food source in parts of the Andes. 11.04.16 One of our visitors, inspired by my enthusiasm for nasturtiums in salads, took a bag of leaves away and told me that it makes a good soup when used in a watercress soup recipe. 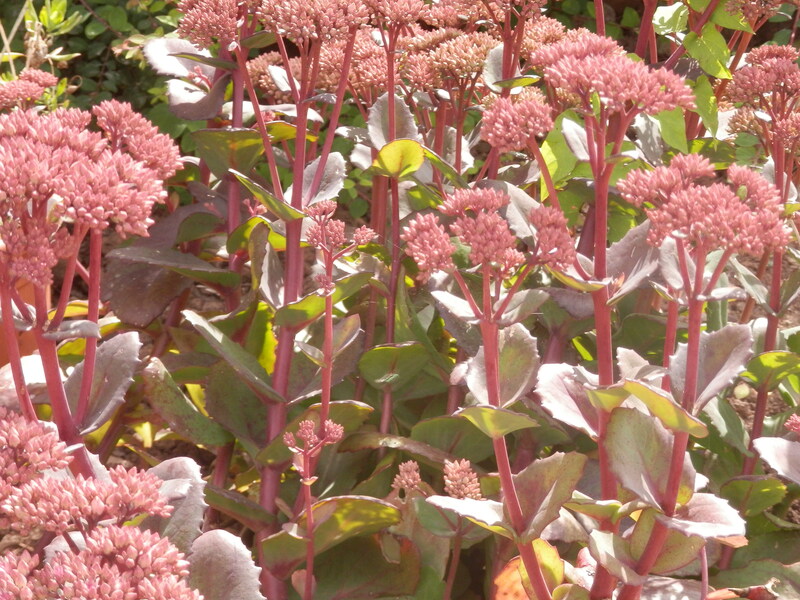 I had a look through a foraging book on Friday afternoon and was surprised to find that sedums are edible, with one or two exceptions. I’m not going to test that out as many of the stonecrops are small and fiddly and probably pick up a lot of soil when harvested – a bit like chickweed. 11.04.16 I did try eating stonecrop after this. Having read it was an option in survival conditions but too bitter for anything else I can confirm that it is terribly bitter and yes, though I now know you can eat it without mishap I would only try it again if I was in a life or death situation. However, the leaves of the ice plant are included in this and I have quite a few of them. I suspect the plant I have may be a nectarless cultivar as we don’t seem to get many insects on it, so at least it will justify its place if I can eat it. Well, I tried and can report that the leaves are pleasantly crunchy and succulent with a faint taste of avocado. I wouldn’t grow them specially to eat but they are reasonably palatable and, being from a red variety, will add a bit of colour to a mixed salad. Great post. I do love it, because the idea of this post is excellent. I’ve avoided fungi so far – not confident of my abilities in the identification department. 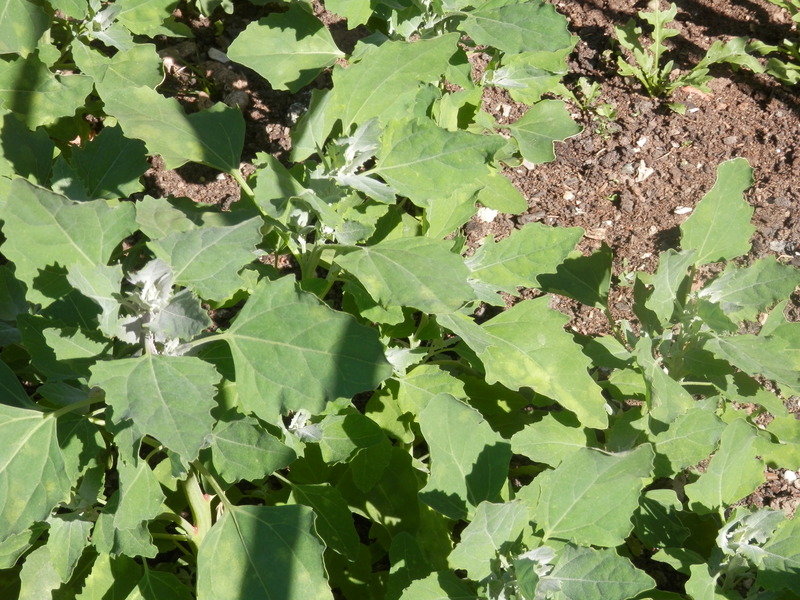 However, a lot of the other salad leaves seem quite safe and I’ve fed wild salads to many visiting groups. Most of my stuff comes from the garden. I will try your recipe – just discovered ground ivy after years of thinking it was dead nettle! PS – Mushrooms are amazingly healthy for you :). Of course, so are salad greens. Aren’t we awesome? My mushroom-growing medium came in the mail. Still not as easy as pie, but I did get mushrooms 🙂 – so cool! That link I gave you gives the details. I’ll give it a go – you give mushrooms such good press I can’t wait to start eating them! I see you have a recipe for chive blossom vinegar: I eat chive blossoms as they are, much easier. On my bread, salads, whatever. Later in the year, when they’ve gone, there will be something else to eat! Good stuff! Have you ever tried hostas? The ornamentals many people have in their garden, under trees, unfortunately covered with slug pellets as they seem to need that to survive? They are very edible, and I haven’t had to use slug pellets yet ….. See, for instance http://mofga.org/Publications/MaineOrganicFarmerGardener/Spring2013/Tip/tabid/2568/Default.aspx. Thanks. I’ve read that hostas are edible but don’t grow them. After reading the link I’m going to buy some! Ah thank you! We have an awful lot of Alkanet – what a shame it isn’t more palatable. If I ever want my tongue to go numb, however, I now know what to do. Compost it is then, except – honeybees seem to love it – so I’m loath to pull it up whilst it’s still flowering. 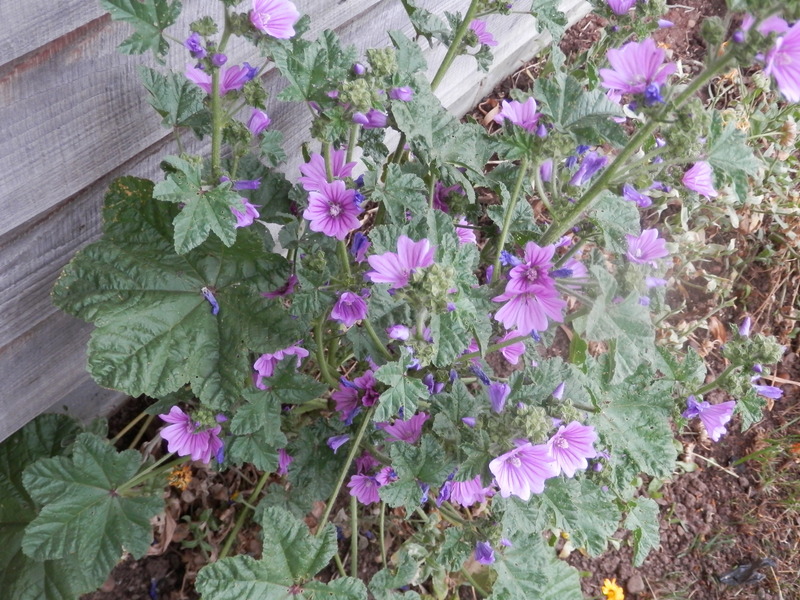 Interesting about the mallow, there are several wild varieties I think, are they all OK in your opinion? I’ve never seen anyone discuss varieties so I’m assuming they are all edible, though some may be better than others. I will have to look for some more varieties. Cultivated one we have tends to be more prolific than wild and leaves more tender.